Saving money is always easier said than done. However, it's not so hard to make the time to consider your savings goals and your options for reaching them. Start slowly, with our ideas for beginning a savings plan and general guidelines for how much you should be setting aside for each of your main goals, such as a vacation and retirement. 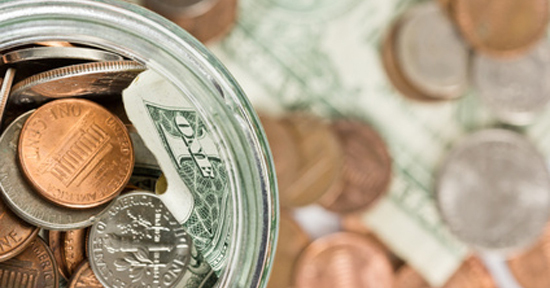 Incremental savings: How much do I save from my paycheck? Save a set amount each week/month: Come up with an amount that you’ll put aside from each paycheck or on a monthly or weekly basis. It’s OK to start small – $20 per paycheck, for example – because even small amounts can add up over time. It's always better to save something rather than nothing. Save a set percentage of your paycheck: Choosing a set dollar amount is fine for people just starting to save, but it ignores weekly or monthly fluctuations in pay, as well as raises or bonuses. Work up to setting aside a percentage of your income and you will be automatically adjusting for these variations. Most experts recommend saving a minimum of 10 percent of your paycheck for all of your savings needs, but if you’re able to comfortably save a higher percentage, go for it. Save for a goal: You may want to buy a house within the next few years or maybe there’s a new sports car you’d really like to own. If that’s the case, set a goal for the amount you’d like to save and the month or year you’d like to save it by. Make sure the amount and timeline are realistic, and then use them to determine your savings plan. If you’d like to save $60,000 for a down payment on a house that you plan to buy five years from now, you need to save $1,000 per month to achieve your goal. Save until you feel it in your budget: Another good rule of thumb for determining how much to save is “as much as you can.” This means keeping a tight budget for housing, food, clothing, and other essentials and saving the rest. If you’re not currently feeling the need to carefully monitor how much you’re spending, you could probably be saving more. Out of all the options, however, this is one that can easily fall apart if you are not monitoring how much – if any – savings you are putting away. Total savings: How much should I have in my bank accounts? Emergency fund: Most experts recommend saving three to six months of expenses in an emergency fund in case you lose your job or get hurt and are unable to work. Your monthly expenses include your rent or mortgage, the cost of food to feed you and your family, monthly loan payments, and other essential spending. To be extra cautious, you may want to continue adding to your emergency fund until you can cover at least half a year of expenses. Unexpected expenses: You definitely want to have an emergency fund in case you lose your source of income, but what if your car suddenly breaks down or you need an urgent home repair? Setting aside some extra money to cover expenses such as these means you won’t have to drain your other savings accounts or rack up credit card debt. Retirement: The earlier you start saving for retirement, the more time the money has to grow by earning interest. Many employers will match the amount you put into a retirement account from your paycheck up to a certain percentage (usually 4-6%). If your employer offers this option, take advantage of it! Not saving the maximum amount that your company will match is like throwing away free money. Remember: small savings add up over time. Even if you can’t afford to save much right now, getting into the habit of putting money aside will pay off later. The key is being disciplined enough to stay with your savings plan, even if it only means setting aside a few dollars each week. Share on Facebook "How Much Money Should I Save?"